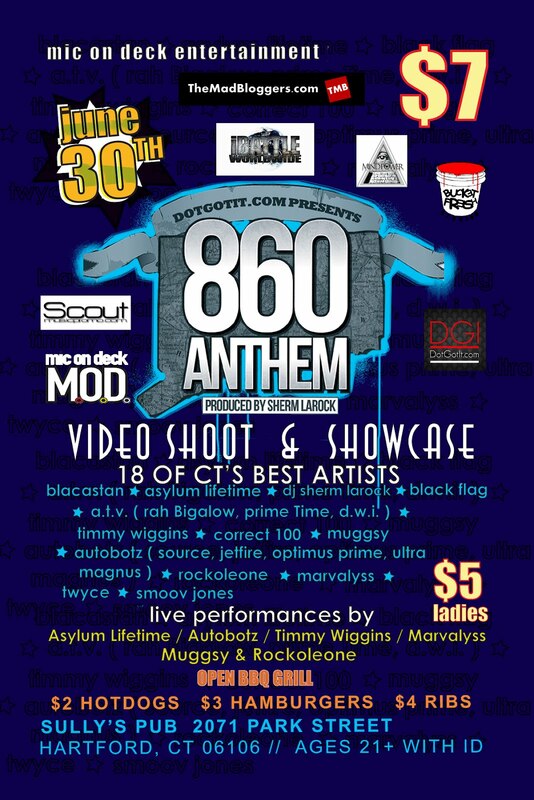 Hartford, CT – June 30, 2012 – MIC ON DECK Entertainment will be holding the 860 Anthem video shoot and showcase at Sully’s Pub, located at 2071 Park Street in downtown Hartford, CT. 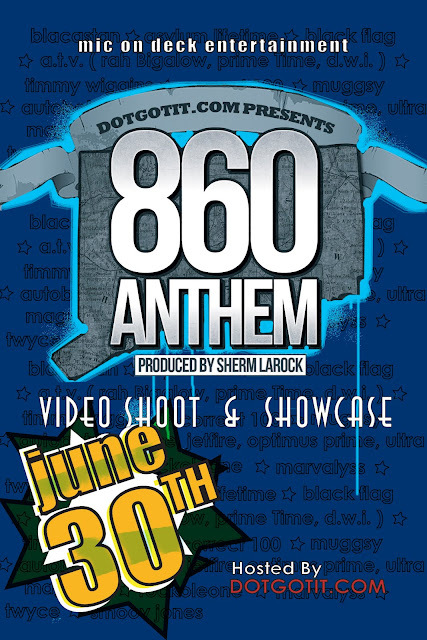 The new song “860 Anthem”, brought to you by DotGotIt.com, is collaborative effort of eighteen of Connecticut’s talented underground hip hop artists. The track was produced by DJ Sherm Larock of Wasted Talent and Underdog Religion. The show will be hosted by DotGotIt.com, and features DJ Sherm Larock on the turntables. There will be live performances by “860 Anthem” artists Autobotz, Asylum Lifetime, Timmy Wiggins, Marvalyss, Muggsy & Rockoleone. 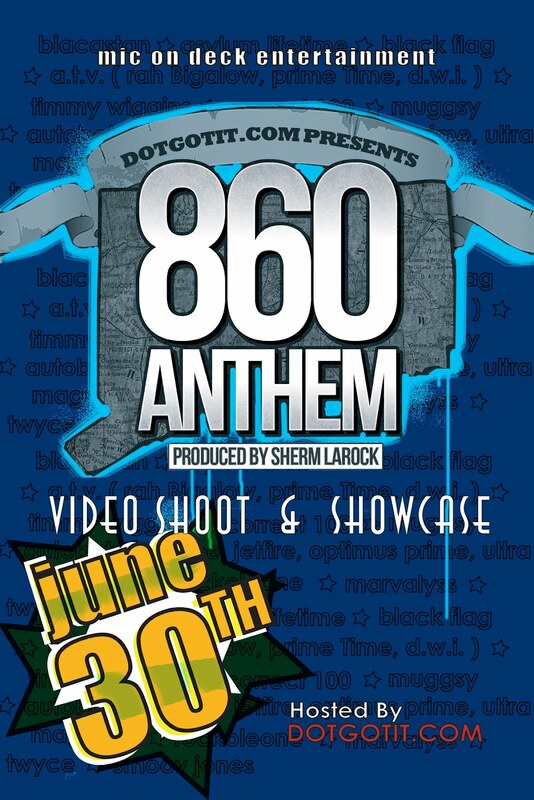 The eighteen CT artists in the "860 anthem" video shoot are: Blacastan, DJ Sherm Larock, Asylum Lifetime, Blak Flag, Autobotz (Source, Jetfire, Optimus Prime & Ultra Magnus), Timmy Wiggins, Correct 100, A.T.V. (Rah Bigelow, Prime Time & D.W.I. ), Muggsy, Rockoleone, Twyce, Marvalyss & Smoov Jones. It will be sponsored by DotGotIt.com, Mind Power Entertainment, Jace Media, Bucket Fresh Studios, iBattle WorldWide, TheMadBloggers.com and Scout Promotions. MIC ON DECK will be celebrating the birthday of Laina Reed at the show. This is a 21+ event with ID, $7 cover and $5 for ladies. There will be hamburgers (plain, with cheese or veggie), hot dogs and ribs served throughout the night. For more information please contact William Sanzi at (860)-938-8476, Michael Lagasse at 860-394-7697, or email MICONDECK@gmail.com. You can also check for information on the “MIC ON DECK Entertainment” page on Facebook or DotGotIt.com. MIC ON DECK & DotGotIt invite everyone to come out June 30th to support and celebrate Connecticut hip hop.